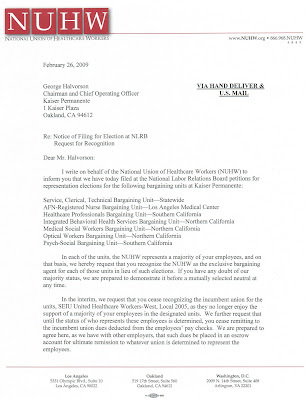 If what the verbiage in the letter states is indeed accurate - that NUHW has collected petition signatures from greater than 50% of UHW's covered workforce, then going by standard card check rules, NUHW is now the de-facto bargaining agent for UHW-covered KaiPerm employees. However, the law is unclear on which version of card check rules is in place. 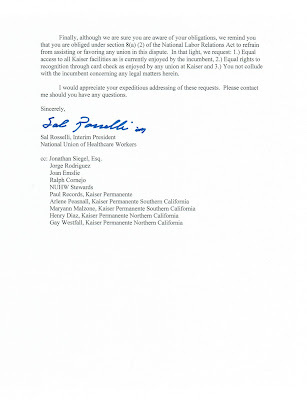 To be sure, though, if EFCA passes, then by law KaiPerm will have to recognize NUHW. Look for the Purple Plague to very shortly and all-of-a-sudden discover a deep and profound opposition to EFCA.